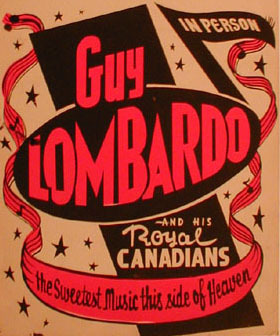 Big Band Library: Guy Lombardo "Days of Auld Lang Syne"
many of which became hits. More than 100 million of his band's recordings were sold. 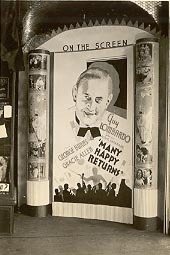 Perhaps most amazing of all was his association with New Year's Eve; he and his band rang in forty-eight new years with the public, from 1929 through 1976. Some people thought he must have invented it. "Oh yeah, yeah, well because they . . . were on for many years," Rose Marie said. "They always brought the New Year in on radio, you know, in the days before television and when television arrived, why then, it was just switched over to [tv]." Like millions of others, his sister was among those who enjoyed the broadcasts. "Yeah . . . it was family and you wanted . . . to hear the show," she acknowledged. "And they always had guests on." After playing at Lake Erie resorts on the Canadian side, Guy brought his band to the U.S. in 1924, for engagements in Cleveland, first at the Clairmont Cafe and then at the Music Box Restaurant. In 1925, they adopted the name "the Royal Canadians." Two years later, they were hired to play at the Granada Cafe in Chicago, where they did their first network radio broadcast, over CBS. And in 1928, the group started using the slogan "the sweetest music this side of Heaven." "I know they used to be referred to as a 'mickey-mouse' band, by people that didn't like it," Rose Marie said. But that didn't offend Guy. "No, no," she stated. "'Cause he knew he was successful." He willingly shared credit with his brothers who played in the band: Carmen (on alto saxophone and vocals), Lebert (trumpet), and, later, Victor (soprano and baritone saxophones). He may have enjoyed quoting figures such as record sales or attendance receipts which indicated the popularity of his music, and he had good reason to boast - formed in Canada in 1921, it was one of the most successful and imitated big bands of all time. But analyzing why Guy Lombardo was such a long-lasting success takes more thought --- even for his sister, Rose Marie. "Oh God [laughs], I don't... Well, it was primarily a dance band and I guess most people like to dance . . . The tempos were easy to dance to . . . they didn't fool around too much with the melody," she told me, on the telephone in 2004. "I don't know... I suppose, you know, everybody has their own reasons for liking it, or disliking it." 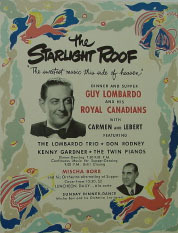 Meanwhile, among the male singers with the Lombardo orchestra, other than Carmen, Kenny Gardner [ l. ], who was hired in 1940, clearly became the biggest star. "Oh, he fit in beautifully," she observed. "First of all, Kenny had a very good voice. He had a nice style." It was another Lombardo sister, Elaine, who first heard Gardner on a "sustaining" (that is, non-sponsored) radio program. "And my sister thought he had a fantastic voice," Rose Marie continued. "She was working at a music publishing firm, at the time. And Kenny happened to come up - he was originally from California - and he was in New York and he went up to Harms Music, where Elaine was working... I don't know, to get some sheet music or something or other... I can't remember the whole thing. Anyway, she was the one that kept telling Guy, 'You've gotta hear this Kenny Gardner, he's great, he would be wonderful for the band.'" Elaine married Gardner before he left to join the service during World War II. Guy played violin in the early days, but primarily conducted while the music showcased Carmen's exaggerated sax vibrato and quivering vocals, Lebert's virile trumpet, and Victor's sweet saxophone. "They all worked in concert," she agreed. "I think they all had the same goal in mind. Each one probably had their own [opinions] about certain things, but I think they all had the same idea." Since the band bore Guy's name, he had the final say. "Yeah, I suppose," she said. "But Guy and Carm were . . . They certainly weren't going to do anything to the detriment of the family or the band. And then my brother Victor joined them much later. He joined them in 1929. They had already arrived in New York, by that time." The fame that Guy had and retained for some 50 years didn't seem to change him. "No, I don't think it changed him," she commented. "He wasn't arrogant. . . . I think this was kind of instilled by my father, that you always make sure you give people their money's worth, so to speak. Don't, uh... oh heck, I don't know how that I could put it into words." Was it planned that so many brothers and, eventually, she would become involved in the band? "No," Rose Marie explained. "As a matter of fact, it was the very... When they were young kids in London [Ontario], my mother belonged to the 'mother's club' - you know, any club that was around, she would . . . always volunteer their services, if they had a little tea party or something... or a garden party. My mother would volunteer their services, to play. My father never in his wildest dreams ever thought that they were going to take it up, as a profession. My father was a great lover of music - he sang, he took music lessons - and he always thought that it was just a nice, uh... a social... part of the social graces, maybe, to be able to sit down and play an instrument. But he didn't have any idea that they were going to make it their profession. As a matter of fact, when they decided to go to Cleveland, he thought, you know, that they were foolish, that this music thing should just be a sideline or something for their own amusement. He didn't think they were going to make it a professional career." "Everybody liked Guy," Rose Marie told me. "He was very personable, and... well, it's true of all my brothers. They enjoyed what they did and I think that comes through." Guy, too, was evidently the best businessman of them all. "Yeah, I think so," she agreed. "I think he was... He was very... what's the word I'm trying to think of . . . Guy and Carm, they always worked in concert, there was no doubt about that. But Guy was the one that did the business dealings. Carm, of course, wrote songs. Then Lebe . . . whatever they wanted to do, why, it was fine with him. And then Vic was the same as Lebe... you know, whatever anybody wanted to do, whatever Guy and Carm decided, that was it." 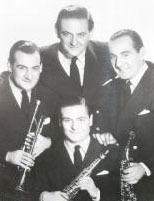 During Guy's lifetime, only Victor would ever depart the band and start his own group, in 1946 (though he eventually returned.) "Well, Vic, before he joined the band, he had a band of his own, that he worked around Canada. You know, Niagara Falls, Toronto, London," she noted. So how did Rose Marie, who was born in 1925, begin singing with the band? "I don't know," she laughed. "I guess they thought I had a fairly good voice. I don't think I had a great voice, by any means." Her parents didn't raise any objections. "No," she said. "I guess it was just taken for granted that I was going to join the band." She began appearing with her brothers in 1941, but, actually, had made a record, Little Shepherd of My Dreams, with them two years earlier. "This is like going back into ancient history," she remarked. "It was primarily a dance band. It's not the greatest... a singer doesn't get much of a... You don't take too many liberties with tempo or fooling around with the melody. And Guy was a stickler for sticking to the melody. You know, not too many tricks." There was another Lombardo brother, Joe, but he never wanted to be a part of the band. "Oh God, no, no," she confirmed. "He never even took any musical... he had no music lessons at all. He wasn't the least bit interested in it." Instead, Joe pursued an art degree and became an interior decorator. She remained with the Royal Canadians into the late '40s, then opted for a domestic life. "I was married when I was 17," she explained. "I eloped. My husband was in the service, so he was away most of the time. Then, after the war, when he came back, why then, that's when I decided it was kind of silly, because he worked during the day - as a normal person would - and I worked at night, so we'd pass each other going through the doors [laughs]. And that's when I decided . . . after a couple of years, that I didn't want to be doing that anymore, and then I quit." Apart from being his sister, she had made history as a member of Guy's band. "I was the first girl singer they had, and the last," she pointed out. "There were other girl singers that did guest appearances with them, on the special shows and so forth, but I was the only one that sat on the bandstand." She returned once, for one of Guy's well-known New Year's Eve broadcast specials. "Uh, yeah I did, many years later," she recalled. "It was about, I don't know, 1955 or '56." Nowadays, how often does Rose Marie play or hear one of her brother's records? "Well, to tell you the truth, I don't listen to the radio that much," she replied. She is, however, aware of a couple of recent films that have included his music on their soundtracks. "What's the wonderful movie... oh, 'While You Were Sleeping,'" she said. "This one scene takes place New Year's Eve, and there's many references to the Guy Lombardo band . . . [and] there's a Robert DeNiro movie... I wish I could remember what the heck the name of it is... it takes place in New York, and at the very end, there's an old recording of the band, they play Red Sails in the Sunset." As for the Internet websites that detail his various accomplishments, she hasn't seen them. "I don't have a computer and I have no desire to get one," she told me. "I'm too old [laughs] and I'm lucky if I can get my television set working." 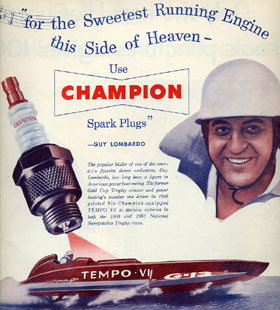 second-place in the Fite Memorial Trophy Races at Ocean City, NJ in 1941, then won three first-place finishes in 1946, namely the Davenport (Iowa) Speedboat Races, the National Sweepstakes Championship in Red Bank, NJ, and the International Gold Cup, in a ninety-mile race in Detroit. 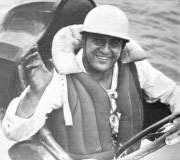 At Jones Beach in New York, where he produced popular musical shows from the mid-50s on, he would delight fans by arriving in his boat, and even after he retired as a competitor, he kept an interest in speedboat racing. Throughout the years, the Lombardo band personnel was remarkably stable. 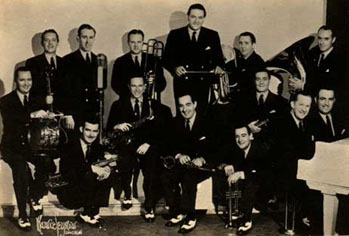 In 1949, along with Guy, Carmen, and Lebert, five men had been in the band since 1924: James Dillon, trombonist; Fred Higman, saxophonist - vocalist; Larry Owen, saxophonist - arranger; Fred Kreitzer, pianist; and George Gowans, drummer. Guitarist - vocalist Bill Flannigan would join in 1950 and stay until 1965. Enroughty, Joe and The Guy Lombardo Society. E-mail to author, Aug. 7, 2004. Nov. 10, 1977, sec.IV, p.23, col.2.